Muddy says: Unique and exciting, we love Fish4Lunch – quality, fresh fish dishes from the market’s newest catch at super reasonable prices, served above Oxford Fish Market in Osney Mead. The kind of business that Muddy Stilettos exists for – quirky, under the radar and exciting. Just a 15 minute walk from central Oxford you’ll find this hidden gem of a lunch spot upstairs in Osney Food Shed, Osney Mead. Fish4Lunch was started to promote fish cookery and a positive image of the fishing industry and it does exactly what is says on the tin- serves great quality fish, from in and around the coasts of Great Britain, at lunchtimes Tues – Sat, showcasing fresh fish being sold in Oxford’s first fish cash and carry, Fish Market Oxford. 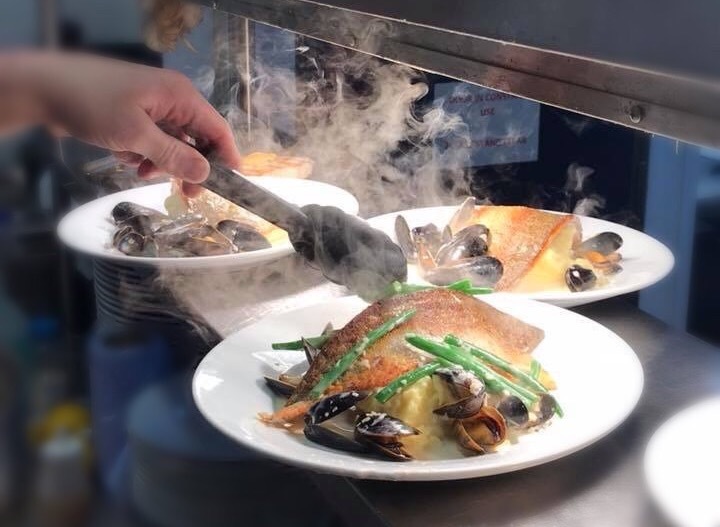 Over 100 varieties of sea and fresh water fish are stocked each day in Fish Market, plus lobsters, crab, scallops and mussels, with the menu changing every two weeks to reflect the best of what’s in stock (check out Facebook for menu updates). There’s no catch (oh come on that’s brilliant! ), prices are super reasonable, with fish and chips served every Friday too. If fish doesn’t take your fancy, the same team owns Aldens Butchers (also on the Osney Estate) and The Butchers Kitchen which runs three hour workshops led by craft butchers where you can learn about meat, butchery skills and how to cook each piece to perfection. Oh, and you get a meaty feast thrown in at the end with wine. Some friends have been eating here for a while and really rate it. I would love to try it – it sounds absolutely my kind of place – but I have mobility problems and I can’t manage the steps. Please, Muddy, use your not inconsiderable influence to encourage them to think about a downstairs table or two, or a lift.